Putting a soft spin on a classic design, this smooth snake-chain bracelet in the beautiful PANDORA Rose metal blend brings femininity to minimalism. This stunning bracelet can be worn on its own, or use silicone-lined clips to space out charm stylings. Available online or in-store. PANDORA Rose MOMENTS Smooth Bracelet is rated 4.1 out of 5 by 23. Rated 5 out of 5 by Sir Amo from Great gift for the mrs! Makes a great birthday or valentines gift. She loved the color and style. When choosing a size it should be about an inch longer than the diameter of her wrist to accommodate for the charms. Rated 1 out of 5 by Donz from It faded Faded so easily, mine is just 6 months old. I’m really sad about it. Do you have any recos to make it look beautiful again? Or can i exchange my rose snake chain bracelet with any other except for another rose collection again? Rated 1 out of 5 by Victoria1981 from Beautiful, until it fades. I bought this bracelet less than a year ago. I was so excited. Looked gorgeous and couldn’t wait to collect more. First, one of my charms and the rest were fading and I went in hoping to replace them. I didn’t realize how much of a challenge that would be. He then pointed out the bracelet was fading as well. I explained I noticed the change but thought maybe I wasn’t cleaning it well. The manager didn’t seem interested in exchanging any of it and agreed to switching out the charms as she stated the bracelet looked “fine.” I just went back today to show them how bad the bracelet had gotten. I explained if it is that fragile and couldn’t handle being worn with other bracelets or etc I didn’t want it. But they didnt seem to care. After seeing these reviews they should offer a better solution. Rated 4 out of 5 by parcelandpeony from Stunning Rose A gorgeous warm rose colour, this bracelet is stunning even worn alone without charms. I have not owned it very long and time will tell how the plating holds up as it is an alloy mix of copper and silver. Rated 5 out of 5 by JanneLiis from Must Have! I intended to go to Pandora to only buy my mother a Mother’s Day present, however, instead I walked out of Pandora with 3-braclets. Purchasing one for my mom, sister and myself. This bracelet is just stunning, it's lightweight and very durable. It doesn't lose its shine or color. Also, to include the bracelet will be a little tighter at first and will loosen up a slightly after wearing it. Trust me you will love the new Pandora Rose collection! You'll be charmified! Rated 5 out of 5 by Chitra from Very beautiful!! 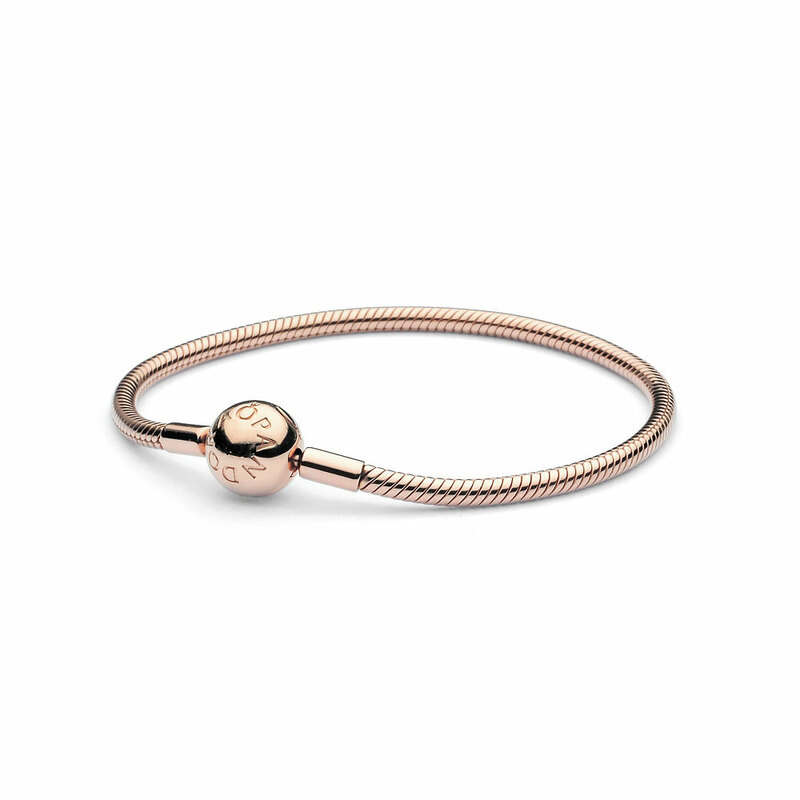 I just fell in love with this Rose gold bracelet,it looks so pretty on my hands..